(Nanowerk News) Zinc oxide (ZnO) is a unique material that exhibits semiconducting and piezoelectric dual properties. Compared with other semiconductor materials, ZnO has higher exciton binding engery (60 meV) and has been studied as an optoelectronic, transparent conducting, and piezoelectric material. In the past few years, numerous studies have been made on both production and electronic and optoelectronic applications of one-dimensional ZnO, typically nanowires and ribbons. "As the ultrawide ZnO nanosheets in our study have both a good crystallinity and a high specific surface area, we see potential future applications as piezoelectric bio-sensors, chemical sensors, and electrode materials in secondary batteries or dye-senstized solar cells" Jae-Gwan Park, who heads the Multifunctional Ceramics Research Center at KIST, told Nanowerk. The sheets are paper-like planar nanostructures and their dimensions are typically 50–300 nm in thickness and 10–100 lm in width. Park notes that the nanosheet structure is far different from the various wellknown ZnO nanostructures including nanowires, ribbons, belts, and comb-like structures. Studying the growth mechanism of these novel nanostructures indicates that they are generated by a "1D branching and 2D filling" process which can be easily controlled by the supersaturation state of reactant vapors. The ZnO nanosheets themselves are single-crystalline, nanostructured in their thickness directions, but large enough to see with the human naked eye and to handle with TEM tweezers. The researchers observed the evolution of various sizes and dimensionality depending on the processing temperature and oxygen contents. 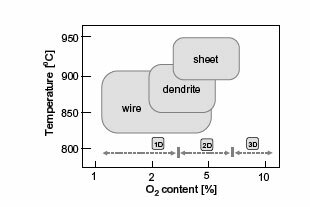 As the amount of oxygen in the flowing gas mixture increases by more than 2%, the nanostructures change from wire-like structures to dendrites, sheets, and eventually micro plates. Park and his colleagues first reported their research on ZnO nanostructures in the Journal of Materials Chemistry "Ultrawide ZnO nanosheets" with subsequent later papers in Journal of Crystal Growth "Synthesis of ZnO nanowires and nanosheets by an O2-assisted carbothermal reduction process" and "Scaffolding and filling process: a new type of 2D crystal growth", as well as in Applied Physics A "Hierarchical evolution of arrayed nanowires, nanorods, and nanosheets in ZnO" and Current Applied Physics "Synthesis of ultrawide ZnO nanosheets".